Iran nuclear talks enter the decisive, dangerous endgame Thursday with a marathon final round of hardball negotiations potentially going all the way to the July 20 finish line. The deal being sought by Iran and the five permanent members of the UN Security Council plus Germany would finally ease fears of Tehran getting nuclear weapons — and silence talk of war for good. With insurgents overrunning large parts of Iraq and Syria in chaos after years of civil war, this could help Tehran and the West normalize relations at an explosive time in the Middle East. But failure could return both sides to the path of confrontation and even war, with neither Israel nor Washington ruling out military action. “In this troubled world, the chance does not often arise to reach an agreement peacefully that will meet the essential and publicly expressed needs of all sides, make the world safer, ease regional tensions and enable greater prosperity,” US Secretary of State John Kerry said this week. “We have such an opportunity, and a historic breakthrough is possible. It’s a matter of political will and proving intentions, not of capacity. It’s a matter of choices. Let us all choose wisely,” Kerry wrote in the Washington Post. “In the next three weeks, we have a unique opportunity to make history,” Iranian Foreign Minister Mohammad Javad Zarif said in a video message released ahead of the talks. After five rounds of talks in Vienna seeking to secure a deal by July 20 — when an interim deal struck in November expires — the differences appear considerable, however. The last meeting from June 16-20 saw both sides begin drafting the accord, but haggling over language concerning the thorniest problems was put off until later. The United States, Russia, China, Britain, France and Germany want Iran to reduce drastically in scope its nuclear activities in order to render any Iranian drive to assemble a weapon all but impossible. This would include in particular Iran slashing its capacities to enrich uranium, a process producing nuclear fuel but also at high purities the core of a nuclear weapon. French Foreign Minister Laurent Fabius said last month Iran has to slash the number of centrifuge enrichment machines to several hundred from almost 20,000 at present. But Iran rejects this, saying it even needs to expand the number of centrifuges to fuel a fleet of nuclear power plants — facilities that it is however years if not decades away from having. Demands that Iran’s program be “radically curbed” rest on a “gross misrepresentation of the steps, time and dangers of a dash for the bomb”, Zarif said. In theory, the July 20 deadline could be extended by up to six months, and many analysts believe that such a move is already being discussed. But US President Barack Obama, facing midterm elections in November and Republican accusations of weakness, is wary of doing anything that could be construed as simply giving Iran more time to get closer to having the bomb. This is the long-standing accusation of Israel, the Middle East’s sole if undeclared nuclear-armed state. But Kelsey Davenport from the Arms Control Association believes that Washington should not shy away from pushing back the deadline if necessary and if Iran is “negotiating in good faith”. “The alternative to no deal is far worse for the international community — a constrained, unlimited Iranian nuclear program,” she told AFP. Japan on Tuesday loosened the bonds on its powerful military, proclaiming the right to go into battle in defence of allies, in a highly controversial shift in the nation’s pacifist stance. “I will protect Japanese people’s lives and peaceful existence. As the prime minister, I have this grave responsibility. With this determination, the cabinet approved the basic policy for national security,” Abe told a press conference. Abe has faced down widespread public opposition to the move, which climaxed at the weekend when a middle-aged man attempted suicide by setting himself on fire. Some 10,000 protesters gathered Tuesday near the prime minister’s office to oppose the plan, Kyodo News reported. While the move to allow so-called “collective self-defence” needs parliamentary approval, the control of both chambers that Abe’s Liberal Democratic Party enjoys renders this a formality. Abe had originally planned to change Article 9 of the US-imposed constitution, which was adopted after World War II and renounces “the threat or use of force as means of settling international disputes”. But unable to muster the two-thirds majority he needed in both houses and unlikely to get an endorsement from the public in the required referendum, he changed tack, using what opponents say is sleight of hand to alter what the clause means. Supporters say the reinterpretation is necessary because of the worsening security situation in East Asia, where an ever more confident China is pushing its territorial claims and an erratic North Korea is threatening stability. Under the new definition, Japanese troops will be able to come to the aid of allies — primarily the US — if they come under attack from a common enemy, even if Japan is not the object of the attack. Examples pushed by the Abe camp have included a missile attack by North Korea on US forces in Guam; they say the shift would allow Japanese troops to shoot down the missile as it passes overhead, something presently not allowed. China has warned against the move, saying it opens the door to remilitarisation of a country that is not sufficiently penitent for its actions in World War II. Just ahead of the announcement Beijing said Tokyo was guilty of “stirring up troubles on historical issues”. “It’s only natural for us to wonder if Japan is going to change its path of peaceful development that it has long pursued after the Second World War,” said a foreign ministry spokesman. The Japanese administration rebuts this, saying the change will allow it to promote a notion which it has dubbed “proactive pacifism”. But that will not entail involvement in military adventures overseas, such as in Afghanistan. “There will be no change at all in our principle not to allow the dispatch of forces abroad,” Abe said. The move has received backing from Washington, which has long encouraged Japan to take on more of a role in a very lopsided defence treaty. But it has caused anger at home, where the pacifism on which the constitution is built is an article of faith for many Japanese. At least half the population opposes a more aggressive military stance, according to weekend newspaper polls. Hundreds, and sometimes thousands, of people have turned out to protest against the change at various demonstrations over recent weeks. Sunday’s dramatic suicide bid near a busy Tokyo train station was the most extreme example of the strength of feeling. “Listen to the voices of the people!” and “Do not destroy Article 9 of the constitution”, protesters chanted Tuesday. Housewife Chieko Hirano, aged 63, told AFP: “I have come here to stop Japan from becoming a country that can go to war. BAE Systems will axe 1,775 shipbuilding jobs and close the historic Portsmouth yard in Britain as government austerity hits demand, the British maker of military equipment said on Wednesday. The yard in Portsmouth, on England’s south coast, will be closed in the second half of 2014, but an engineering team will be retained to support new Type 26 warships, which will be built in Scottish city Glasgow, BAE said in a statement. The undisclosed cost of restructuring BAE’s shipbuilding business will be borne by the Ministry of Defence (MoD), the company added. At the same time, the British government is imposing deep cuts to defence budgets as part of a round of sweeping public spending reductions aimed at slashing the nation’s deficit. The MoD also announced plans on Wednesday for BAE to build three new Offshore Patrol Vessels for the Royal Navy. BAE’s share price ended the day up 0.55 percent at 455.8 pence on London’s FTSE 100 index, which closed flat. A total of 940 jobs will be lost in Portsmouth, with another 835 axed in Filton in the southwest and at facilities in Glasgow and Rosyth in Scotland by 2016. Prime Minister David Cameron described Wednesday’s announcements as “extremely difficult decisions and our first thought should be with all of those who are affected”. Portsmouth is steeped in naval history, and is home to Admiral Lord Horatio Nelson’s preserved flagship HMS Victory, upon which the British war hero died during the Battle of Trafalgar in 1805. BAE Systems said it had reached a deal with the government “to enable the implementation of a restructuring of its UK naval ships business” resulting in the loss of 1.3 percent of its global workforce of 88,200 people. “Consultation will commence on a total employee reduction of 1,775,” it added. BAE said it had experienced a “significant” reduction in workloads following the peak of activity on its current programme to build two aircraft carriers. Trade unions described the cuts as a “devastating” blow for the industry. “There is no doubt that this is a devastating day for the UK shipbuilding industry,” said David Hulse, a senior official with the GMB union. The newly-commissioned MoD ships will meanwhile be built at BAE’s shipyards on the (river) Clyde, Glasgow, and will play a “key role” in counter terrorism, counter-piracy and anti-smuggling operations, the MoD said in a statement. “This deal will provide the Royal Navy with three brand new maritime patrol vessels with a wide range of capabilities which will support our national interests and those of our overseas territories,” said Defence Secretary Philip Hammond. In addition, the MoD will invest more than �100 million ($161 million, 119 million euros) to expand the dock at Portsmouth, which will become home to the two new aircraft carriers — HMS Queen Elizabeth and HMS Prince of Wales. Hammond revealed that the cost of the two new aircraft carriers had risen to �6.2 billion. That was more than double the original �3.0-billion cost when the deal was announced back in 2007 under the previous Labour government. BAE, which has been rocked by government cutbacks to military spending worldwide, was also hit last year by the collapse of a proposed mega-merger with European aviation giant EADS. Paris-based EADS recently warned that it will have to apply tough restructuring to its own defence activities. Jailed Kurdish rebel chief Abdullah Ocalan was set to call a “historic” ceasefire on Thursday, raising expectations for an end to a three-decade conflict with Turkey that has cost tens of thousands of lives. The widely anticipated ceasefire call is to come in a letter penned by the leader of the outlawed Kurdistan Workers’ Party (PKK) from his isolated island prison cell, and millions of people nationwide are set to tune in to hear his words read out on television and radio. The announcement, which Ocalan in a previous letter said would be “historic”, has been timed to coincide with the Kurdish New Year, or Newroz, that will see hundreds of thousands gather for celebrations in the Kurdish-majority city of Diyarbakir. The ceasefire call would cap months of clandestine peace talks between Turkey’s spy agency and the state’s former public enemy number one Ocalan, who has been serving a life sentence for treason and separatism on Imrali island off Istanbul since 1999. Prime Minister Recep Tayyip Erdogan and Ocalan both appear to have staked their political futures on the renewed push to end the 29-year armed campaign for self-rule that has killed some 45,000 people, mostly Kurds. Erdogan said he was putting his faith in the peace process “even if it costs me my political career”, in the face of accusations that Ankara was making concessions to Ocalan — routinely labelled a “terrorist chief” and “baby-killer” by Turks. A solution to Turkey’s ingrained Kurdish problem could etch Erdogan’s name in history, in much the same way the abolition of slavery enshrined Lincoln’s memory for Americans a century ago, wrote Murat Yetkin, editor-in-chief of the Hurriyet Daily News. “If he can do this and convince people that a political solution to Kurdish problem is on track and the conflict is over, yes, there is a chance that Erdogan can be the Lincoln of Turkey,” he wrote in February. Ocalan — known as “Apo” or uncle to Kurds — has said he wants peace for the greater good of his people. “Consider Apo dead if this process fails. I am simply out,” the burly 64-year-old was quoted as saying in a rare prison meeting with Kurdish lawmakers last month. Ocalan’s expected ceasefire is likely to be in return for wider constitutional recognition and language rights for Turkey’s up to 15 million Kurds. The peace plan is expected to be the result of written consultations between Ocalan, pro-Kurdish lawmakers and PKK bodies in Europe and northern Iraq, under the close monitoring of Turkish agents. Kurdish lawmakers say Ocalan might ask for commissions to be established to properly monitor the ceasefire, and call for safe passage for fighters wishing to leave Turkey. Erdogan has already vowed that no militant would be “touched if they leave the land”. But the rekindled peace process has not been without controversy. Nationalist opposition leader Devlet Bahceli has accused Erdogan of “treason” and “selling out the country to a bunch of bloody bandits”. The ceasefire will also be a test of Ocalan’s influence over the PKK after years of being cut off from the outside world. At least four previous ceasefire attempts called by Ocalan have stumbled over a lack of faith between the PKK and its arch enemy Ankara. With each failed ceasefire, the violence escalated. Asked if the new peace process would be successful, Justice Minister Sadullah Ergin told reporters “there are no guarantees”. “But we know what is going to happen if it does not,” he said. In a sign of goodwill, the PKK last week freed eight Turkish prisoners it had been holding hostage for some two years. The rebel movement wants to see the release of hundreds, if not thousands, of people detained on charges of links to the PKK. Under Erdogan, in power since 2002, the Kurdish minority has been granted more language rights in recent years, including the establishment of a Kurdish-language television channel. China successfully launched three astronauts into space aboard a Shenzhou-9 space capsule atop a Long March rocket to begin the nation’s most ambitious space mission to date. This launch also represents the first occasion a Chinese female astronaut has been included as part of the crew. In the early evening hours of 16 June, the Long March rocket lifted off from China’s remote Jiuquan Satellite Launch Center located on the fringe of the northwestern Gobi Desert in what appears to be a textbook-perfect launch. Eight minutes after launch, the Shenzhou-9 capsule entered orbit and deployed its solar panels precisely on schedule. Thirty-three year old Liu Yang, an Army pilot with more than 1,680 flight hours to her credit, became China’s first female astronaut to travel in space. Her duties during this mission are to conduct a series of medical experiments while in orbit. 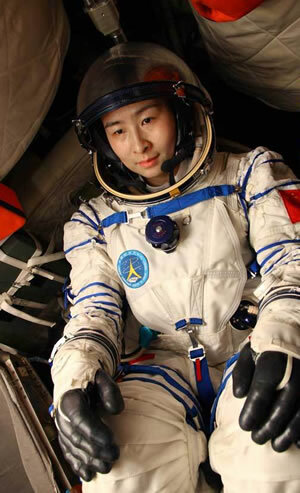 She joined the Chinese People’s Liberation Army (PLA) in 1997 and was recruited as a potential astronaut in 2010. Veteran astronaut Jing Haipeng, forty-six years old and making his second space flight, is the mission commander. Jing was a member of the 2008 Shenzhou-7 mission that included China’s first spacewalk. Rounding out the three-member crew is a space newcomer, forty-two year old Liu Wang. He is an accomplished Army fighter pilot with 14-years of experience serving with the Chinese National Space Administration’s astronaut corps. This mission represents a critical step forward in China’s manned space program. The Shenzhou-9 is scheduled to rendezvous with the Taingong-1 (“Heavenly Palace”) space module, launched into orbit in September of last year, as a follow-on to last November’s successful Shenzhou-8 unmanned space mission. The earlier Shenzhou-8 mission successfully docked the spacecraft with the Taingong-1 space lab twice by remote control. 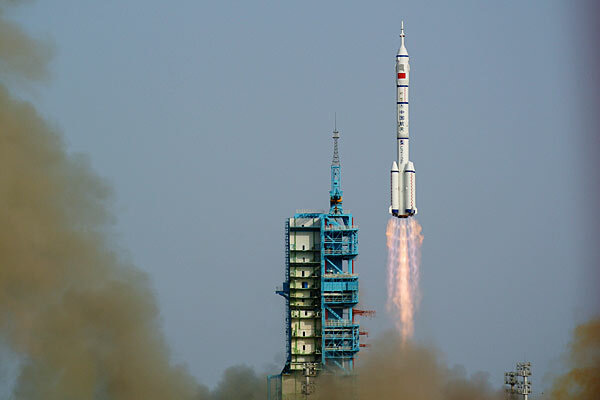 The rousing success of the unmanned Shenzhou-8 mission convinced Chinese experts that a manned mission could be performed successfully at minimal risk of failure. Shenzhou-9 is expected to rendezvous with the Taingong-1 space module at 1500 Beijing time on Monday. The Tiangong-1 is presently orbiting the Earth at an altitude of 213 miles. Shortly after it makes contact with the Tiangong-1 module, the Shenzhou-9 crew will attempt an automated docking to begin a 10-day long series of medical and scientific experiments during their 13-day mission. Two of the astronauts will live in the module while conducting their scheduled experiments and the third crewmember will remain aboard the Shenzhou-9 capsule to handle any emergency situations that may arise. Should all go well, the astronauts are expected to attempt a manual dock with the module before returning home. This would involve uncoupling the Shenzhou-9 capsule, withdrawing to a pre-determined distance, and then having the crew maneuver the capsule into a successful docking operation. Liu Wang is reported to have primary responsibility for the manual docking exercise. The ability to manually dock a spacecraft with the module is critical to future Chinese space ambitions. China has very limited experience in cooperative space activities with other nations. Due primarily to US objections, China was excluded from engaging in joint operations aboard the International Space Station (ISS). This exclusion, viewed as a humiliating snub by Chinese leaders, prompted the national leadership to begin planning a Chinese-only space lab. The Tiangong-1 module is only a prototype of the lab China intends to build. The ultimate goal is to construct a permanently-manned station of some 60 tons featuring a 20 to 22 ton central module connected to two flanking research units. Chinese experts claim that the station would be resupplied by space freighters operating in the same manner robotic ships are employed to resupply the ISS now. The planned permanent station is tentatively scheduled for completion sometime in 2020. China’s ambitious plans largely hinge on the success of this latest mission. Measuring a mere 10.5 meters in length and weighing in at only 60 tons, the proposed Chinese space station would be much smaller than the 400-ton ISS, but it would represent a major technological achievement for the Chinese and would advance their desires to launch a manned moon mission sometime after 2020. China has made impressive strides in its space program in recent years. The first manned flight was launched in 2003 giving Yang Liwei the honor of being the first Chinese to orbit the Earth. The 2003 mission was followed by a two-man space flight in 2005 and a three-man excursion in 2008. During the 2008 mission, the three-man crew successfully competed China’s first spacewalk.With two satellites previously launched on moon operations and a third mission now being planned to place a rover on the moon’s surface in 2013, China has dedicated billions to its aggressive pursuit of space exploration. This is all quite a contrast to the day in 1949 when Chinese leader Mao Zedong complained bitterly that it was a sad truth that his beloved country could not even manage to launch a simple potato into space. Despite these exceptional accomplishments, China is still trailing the United States in critical space activities like manual docking and a Chinese manned mission to the moon, to duplicate the American moon landing, is likely many years away. Due to budget constraints and political infighting, the United States is not expected to launch another manned space vehicle until 2017 at the very earliest. With NASA’s manned operations mostly in limbo, the Obama administration has been pumping significant amounts of money into development efforts to support commercial spaceflight operations that NASA is no longer equipped to perform. The US is currently budgeted to spend approximately $3 billion a year to fund commercial development of space vehicles capable of carrying astronauts back to the moon and to other celestial bodies of interest.With this launch, China has now become only the third nation to place a female astronaut in space using domestic technology. Events of this nature represent a key boost to China’s efforts to instill in the citizenry a heightened level of national pride and to demonstrate to the international community that China is poised to accept the role of international powerhouse. Although the challenges facing China in its assault on space are still formidable, this latest launch brings the nation a step closer to realizing its dream to place a Chinese astronaut on the moon.